It’s no secret, homes just aren’t selling as fast as they once did. If you are trying to sell your home, your landscaping could be your best advertisement. If potential buyers are initially drawn in by your home’s curb appeal, you will be more likely to get them inside to tour your home and eventually make an offer. Here are 5 inexpensive tips to increase your home’s curb appeal and help you sell your home! 1 ) Add a few outdoor containers- Container plants, such as large tropicals, add considerable appeal doorways where potential buyers enter and exit the house. These displays also show the endless possibilities for designing with container plants. 2 ) Keep sticks and leaves picked up- Don’t make a potential buyer look at or walk over grass clippings, leaves, branches or pine cones. The tidier your home’s landscaping, the easier it will be to sell your home. 3 ) Trim- An easy way to spruce up your landscaping is to prune up any overgrown trees or shrubs near the home. This will not only make your home look nicer, but it can also highlight the architecture. 4 ) Plant some instant color- Seasonal colors can really makes the landscape pop, and flats of annuals are also relatively inexpensive. 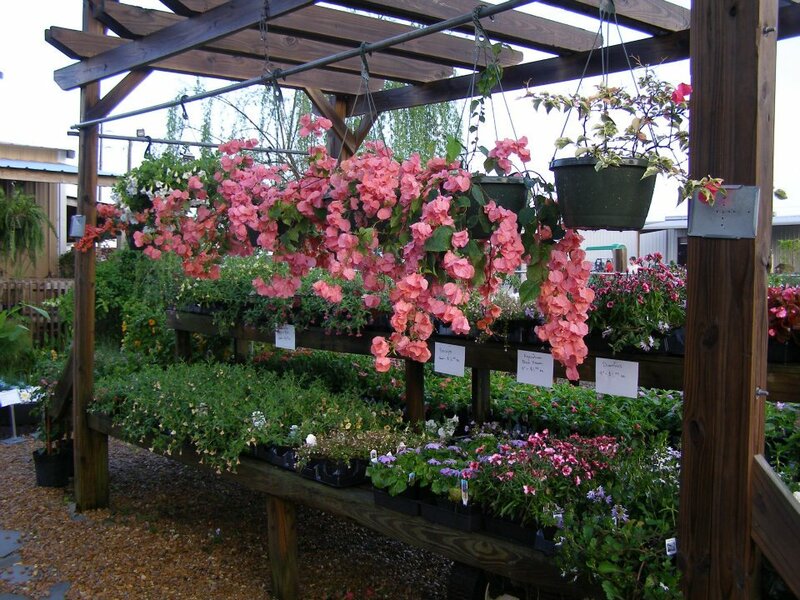 The experts at Brackman’s Stepping Stone Rock and Garden Center, LLC can help you decide whtehter several colors or a more monochromatic scheme fits in with the look of your home. 5 ) Clean and touch-up driveways, sidewalks and patios- Potential buyers notice things like dirty dirty patios, sidewalks with moss growing over, and cracked concrete. Pressure-washing driveways, patios, and sidewalks before putting your home on the market can increase your chances of selling. If you have a little extra budget, consider patching large cracks in sidewalks or driveways. If you need any help preparing your landscape before you put your home on the market, the professionals at Brackman’s Stepping Stone Rock and Garden Center, LLC are here to help with any landscaping or gardening needs. Give us a call today at 601-264-2886 or email us at thesteppingstone@live.com. What improvements have you made to your home that’s on the market? Have you recently sold a home after touching-up your landscaping? Leave us a comment below and tell us about your success stories! Does your family like to go all-out decorating for holidays? Do you enjoy creatively landscaping your yard? If so, we’re here to help. Today we’re going to provide a checklist of Halloween landscaping plants and provide a few ideas for bringing everything together. There are hundreds of ways to decorate for Halloween and all of them are not listed below, so please leave your favorite Halloween landscaping ideas in the comments below or on our Facebook Page. 1 ) Mums – When it comes to Fall, mums are the most popular in bringing Fall and Halloween colors to your yard. 2 ) Pumpkins – Who doesn’t think of pumpkins when thinking about Halloween? Don’t forget to carve your favorite jack-o-lantern! 3 ) Grapevine – Create a Southern or even scary look on your porch or throughout your yard with grapevine. With a little creativity, you can also make some great looking Halloween wreaths from grapevine. 4 ) Gourds – In the video below, you will learn about making shadow boxes from gourds. Be sure to email us pictures of your shadow boxes! 5 ) Cornstalks – A great addition in a basket with your other Halloween decorations, or on top of your hay pedestal. 6 ) Pinestraw/Hay – Pinestraw and hay can be used to help craft a scarecrow, or as a pedestal for your pumpkins, gourds, or other decorations. 7 ) Dead Flowers – When combined with a pile of dirt, dead flowers can make a “graveyard” area in your yard! 8 ) Lights, inflatables, and other retail merchandise – There are several local stores in which you can purchase additional Halloween decorations that will provide some flare or scary elements to your yard. If you decide to purchase these items, design around them in a way that can make them the focal point of your yard. Remember that landscaping for Halloween can be a fun family activity that shouldn’t break your pocket books. Most of these decorations can be used for the entire Fall season. Be sure to re-use old supplies that you have in your garage or shed such as empty planters by filling them with some of the Halloween supplies listed above. Decorate your shrubs and tree limbs with spider-webs, lights, and hanging ornaments from your local garden center or party supply store. 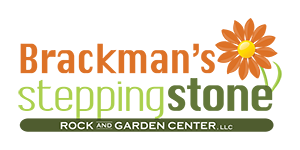 Many of the items on our list can be picked up from Brackman’s Stepping Stone Rock and Garden Center, LLC such as: gourds, pumpkins, mums, and straw just to name a few. If you need any help preparing your landscaping for Halloween, the professionals at Brackman’s Stepping Stone Rock and Garden Center, LLC are here to help with your landscaping or gardening needs. Give us a call today at 601-264-2886 or email us at thesteppingstone@live.com. With the Fall months upon us and Summer officially over, how can you prepare you landscaping for the next season? Should you care for your lawn and garden any differently as the weather begins to cool and leaves begin to fall? We’ll answer these questions plus give you some ideas for landscaping your lawn for Fall! 1 ) Prepare for a freeze – While in South Mississippi the weather won’t start getting extremely cold for a few more months, a little early preparation sure couldn’t hurt anyone! 2 ) Overseed your lawn – Usually the word “over” in front of another word is not a good thing, but when it comes to your yard this time of year it can be a great thing. Overseeding your lawn is a method by which you simply sow seeds over your existing grass to help fill any bare patches. 3 ) Mulch your garden – Yes, even in the Fall you should mulch your garden – once all your plants and vegetables have been harvested or have died. Before mulching you should first remove any plant debris and take care of any weeds (they will come back in the Spring)! 4 ) Aerate the yard – Aerating your yard can create pockets for air, water, and nutrients to enter the soil and roots. For smaller yards, a yard fork will do the job perfectly well! 5 ) Trim your perennials – Working your flower beds this Fall will result in healthier beds this Spring! Remove dead annuals and anything that feeds on them such as slugs, which breed in the Fall. Trim your perennial foliage down to the ground which will send the energy to the roots, strengthening them for next season! 6 ) Plant new shrubs – Planting in the Fall?? Yes! Often times planting new shrubs in the fall will give them a jump-start establishing roots in the cooler weather. Remember that the Fall is a great time to prepare your lawn and garden for the next growing season. A little work now will produce much bigger results next Spring, so pull up your sleeves one more time, crank that mower up a few more times, and prepare your landscaping for the Fall! If you need any help preparing your landscaping for this Fall, the professionals at Brackman’s Stepping Stone Rock and Garden Center, LLC are here to help with your landscaping or gardening needs. Give us a call today at 601-264-2886 or email us at thesteppingstone@live.com. Do you have other Fall preparations for South Mississippi or other climates such as the Northeast? Tell us about your Fall preparation habits in the comments below! While you can spend hundred or even thousands of dollars on the latest gas-powered super tools for your garden, these types of tools aren’t necessary to have a fruitful garden. Today we’re going to focus on the basics and look at 10 essential gardening tools. If you are new to gardening, it maybe best to start with these tools, learn how they work best in your garden, then move up to fancier and more expensive tools. 1 ) Scissors – A simple pair of scissors will be one of the most used gardening tools in your toolkit. From snipping herbs, harvesting small vegetables, opening a bag of potting soil or a seed packet, scissors will come in handy all the time! 2 ) Water Hose – You have all the plants and vegetables that you ever wanted to grow planted, now the most important thing is keeping them healthy by watering them regularly. While an irrigation system is more optimal, gardens are often added “after-the-fact” and a simple water hose will often times get the job of watering done. 3 ) Shovel – Before you are able to plant anything in your garden, you will first need to be able to dig a nice, deep hole for them! A small garden shovel will work best here, as most of your holes won’t need to be as big as a regular hole for larger plants and shrubs. 4 ) Rake – Just like shovels, some rakes work better than others. For gardening, a shrub rake will typically work the best as they are smaller and will fit into tighter spaces than larger rakes used for removing leaves from your lawn. 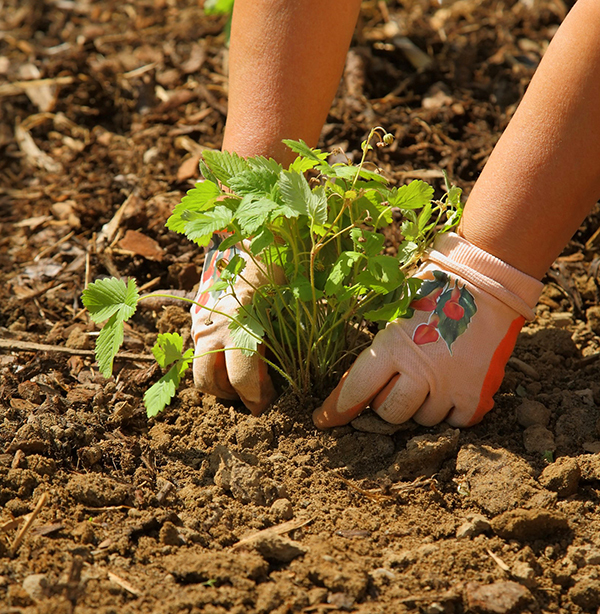 5 ) Gardening Hoe – A gardening hoe can not only remove roots from the top layers of your soil, they also serve the purpose of mixing compost or fertilizer in with the top layer of soil. 6 ) Sunscreen – Being out in the sun for hours at a time on a regular basis can help with a tan, but can also lead to skin cancer. To help prevent any skin damage from UV rays, applying sunscreen before gardening is essential to staying healthy! 7 ) Pruning Shears – Like scissors, pruning shears can serve many purposes from pruning woody perenials to pruning back flowers and fruit-bearing plants. Pruning will ensure you get a healthy yield from your garden. 8 ) Wheelbarrow – If you have a large yard, carrying top soil and other heavy garden accessories can put a wear on your back. Purchasing an inexpensive wheelbarrow can make your gardening experience easier on your body and more enjoyable! 9 ) Weeding Tool – Weeds, weeds, weeds…they always seem to pop-up in your garden and if not taken care of, can choke out the flowers and vegetables that you have been working so hard to grow. A weeding tool can make getting weed of weeds much less painful. 10 ) Gloves – Nothing hurts worse than a handful of blisters. 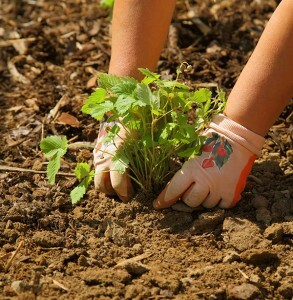 Wearing gloves while gardening can protect your hands from blisters and thistles alike. We recommend buying a pair that fit comfortably, but snugly so that your hands can still be as nimble as possible. Do you have a favorite gardening tool? Maybe a specific type or brand that you find works the best in your garden? Leave a comment below and let us know! Does your lawn ever have that ONE problem spot that always seems to give you trouble? Maybe your lawn has lots of problem spots and you’re just not sure how to repair them. 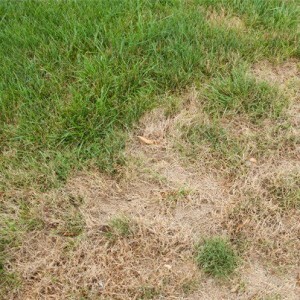 Today we’re going to tell you how you can repair the problem spots in your lawn in 3 steps! 1 ) Prepare the soil – Remove any dead grass and soften any hard soil in the problem spot. 2 ) Seed the problem spot – To ensure the seeds will grow properly, you can try an all-in-one mix of seed, fertilizer, and growing material. You should water the seeds twice each day until it has fully grown. 3 ) Fertilize properly – Start fertilizing the new grass approximately 6-8 weeks after seeding. So in 3 simple steps we’ve fixed the problem areas in our lawn with relative ease. Remember: Prep, Seed, & Feed! Of course, you can find all the materials & equipment needed for this project and any other lawn project at Brackman’s Stepping Stone Rock & Garden Center LLC. Does your yard have one spot that drives you crazy? Maybe your yard is the opposite and has one green spot? If you have any questions or would like to join the conversation leave a comment below or post on our Facebook wall.